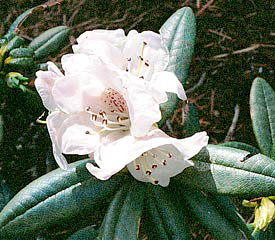 Flower/Truss Description: Funnel campanulate, white or cream to pink, heavily spotted purple. Truss holds 6-10 flowers. Foliage Description: Leaves elliptic, up to 3" long, convex, dense grayish to fawn indumentum.